Joanna and Lincoln Colcord were both born at sea, in 1882 and 1883 respectively. This is a picture of them around 1889 when their father, Lincoln Alden Colcord, was captain of the bark Clara E. McGilvery. 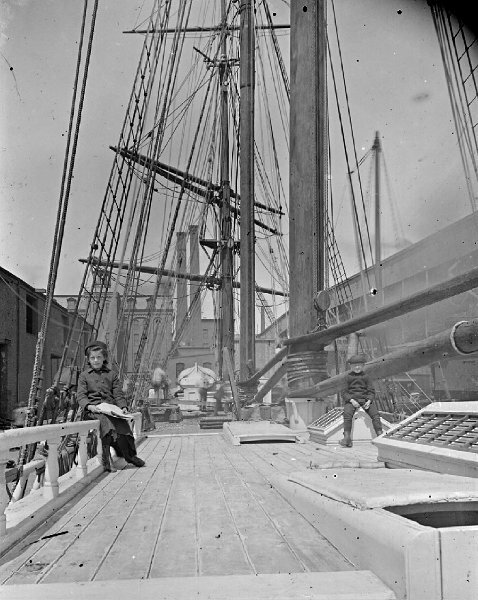 The photograph was taken by the uncle of the children and the brother-in-law of the captain. The vessel was in Boston awaiting cargo. Her sails have all been stripped and much of her running rigging, the lines that control the sails, have been removed.